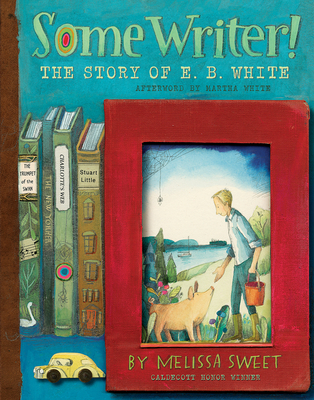 Caldecott Honor winner Sweet mixes White’s personal letters, photos, and family ephemera with her own exquisite artwork to tell the story of this American literary icon. Readers young and old will be fascinated and inspired by the journalist, New Yorker contributor, and children’s book author who loved words his whole life. This authorized tribute, a New York Times bestseller, includes an afterword by Martha White, his granddaughter. Melissa Sweet is the Caldecott Honor-winning illustrator of many fine children’s books including Some Writer! : The Story of E. B. White, winner of the NCTE Orbis Pictus award, Balloons Over Broadway, a Sibert winner, and The Right Word and A River of Words, both Caldecott Honors. Reviewers have described her unique mixed-media illustrations as “exuberant,” “outstanding,” and “a creative delight.” Melissa lives on the beautiful coast of Maine. In addition to writing and painting, she enjoys gardening, hiking, biking, and cross-country skiing. For more information about the author and her work, visit her online at melissasweet.net. "Melissa Sweet's beguiling biography of the author of Charlotte's Web deserves to be savored by anyone who has ever loved White's words." "Whether the name E. B. White is a new discovery or a much-loved author, Some Writer! will captivate readers of all ages."